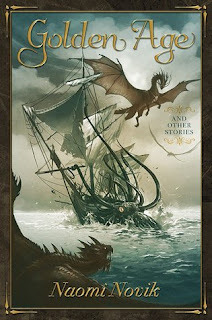 Golden Age and Other Stories is a short story collection from Naomi Novik, all set in her Temeraire universe – set in the Napoleonic period, with the inclusion of sentient dragons. I’ve really enjoyed Novik’s efforts recently – her Uprooted, which I reviewed last year, was brilliant. So this collection had me quite excited as I went into it. The collection contains several short stories, and a set of ‘drabbles’, stories of exactly one hundred words. All have accompanying art, which both sets the mood for the associated story and, to be honest, look rather nice on the page. The first story, Volly Gets a Cow is rather short, tracking Temeraire, the sentient dragon at the heart of the series, as he attempts to get the notoriously unfocused Volly to vote for a dragon member of parliament. Volly is uncooperative, mostly because his attention is focused on his own hunger, and the titular cow. There’s a warmth to this story, the gentle aggravation of Temeraire trying to nudge others into doing something they want to do. We only get quick strokes of Volly and his potential MP here – but enough that their personalities shine through; the dragon representative is a smidge arrogant and abrasive, Volly wooly-headed and, well, hungry. But it’s a cheerful comic tale, showcasing the sort of gentle warmth and humour that sits near the heart of the series, alongside more serious issues – that dragons should be politically represented is an interesting turn, and if it’s only lightly touched on here, still suggests an interesting larger tapestry of events at play. But it’s not all Temeraire – or if it is, sometimes in a different context. Planting Season for example shows us a dragon in the hinterlands of America, after the convulsions of the Revolution. Here, the dragons acts a bridge between the Native American and European cultures – shuttling goods from one to the other, and stepping between the cultures of both. It’s sympathetic and sharply observed, giving us people on both ends of the trade simply trying their best – and left me wondering how the counterfactual Americas were getting on after the fact; the policy of careful integration suggested here is intriguing, and Novik’s talent for making both colonial-era Boston and the Native American wider spaces feel colourful and alive is in full force. Then there’s Golden Age, which shows us an alternative meeting for Temeraire and his Captain – the latter sent out to investigate rumours of French piracy, the former, somewhat accidentally, the cause. The dialogue between Temeraire and the Captain here evoked something in the tradition of Aubrey Maturin; both coming to the table as equals, even if one is a naval officer, and the other a thirty-foot lizard which can breathe fire. Here, it seems like the theme is acceptance – as what would be Temeraire sleeps warmly on a beach, gathering treasure and food – and is shocked out of complacency by the arrival of a human with a loud voice, and a willingness to negotiate. There’s a sense in which several of the stories work better if you’re aware of the larger series; it works as a stand-alone collection, but the context from the wider series helps give it more depth. It was great to see some of the genesis of Roland, for example – a woman with a fine career ahead of her, a forceful personality if ever there was one. As presented, the story of a young woman’s growing into her Captaincy of a dragon, refusing to back down into social expectations, and leading her crew by strength of will and main courage is inspiring and delightful. Knowing what she will go on to do in the broader series gives it the narrative a more complex (but no less pleasant) flavour. One story that works as a genuine standalone, and which I thought was the highlight of the collection, was Dragons and Decorum. Blending the fictional world of Temeraire with that of Austen, it gives us an Elizabeth Bennett who is a naval officer, leading a dragon crew. Novik scrupulously matches Austen’s prose style, but injects her own energy and enthusiasm. Watching an Elizabeth Bennet with agency approach a nervous Darcy, both still constrained by the customs of manners embedded in society of the period – well, it’s an absolute delight. I laughed, several times, and was transported by the evident genuine emotion growing between the two. Bennett is an active participant here, and all the better for it. If other stories in the collection are love letters to fans, then I’d say this one is a paean to the regency novel genre – one which plays with the conventions of that genre, and produces a fine alloy as a consequence. The drabbles are fun, leaping across time and space equally, and providing more insight into the Temerire universe. They’re like short mood paintings, and after the main repast that is the collection, make an excellent dessert. Is it worth buying? Well, if you’re a fan of Temeraire, this may be the last fiction available in that universe. It’s a diverse collection of stories, and there’s something for every fan here – it’ll probably reward your time. If you’ve never read the series before, I’d say it works as a stand alone – but you owe it to yourself to give the other books a try, as they’ll make this collection a richer, more complex experience.